One of the main goals of REACH is to promote non-animal testing methods, including QSAR. ECHA being responsible for the implementation of REACH has the role of providing information and taking actions to make sure that animal testing is seen as last resort. 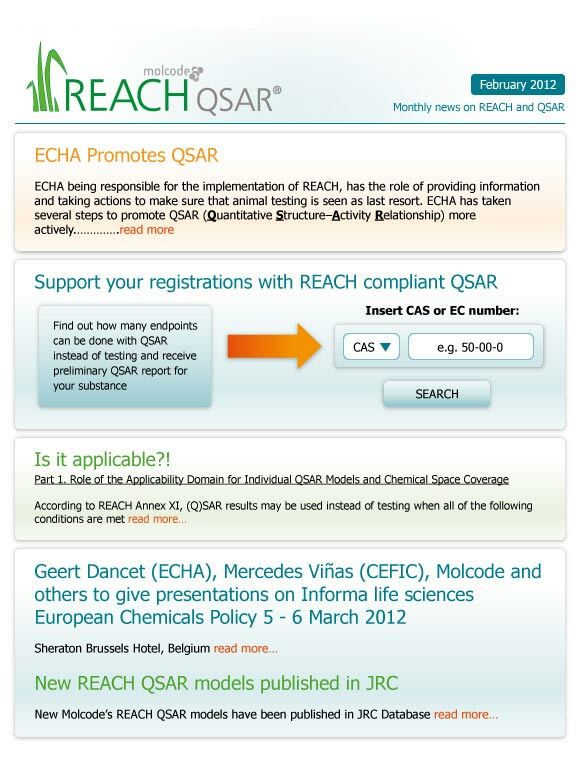 ECHA has taken several steps to promote QSAR (Quantitative Structure–Activity Relationship) more actively. Workshop on the use of the QSAR Toolbox: Feedback from Industry Users and Development Needs, 24 November 2011 Helsinki (find it here). Report - The Use of Alternatives to Testing On Animals for the REACH Regulation 2011 (find it here). Expert Workshop “Dealing with Uncertainty of Non-Test Methods under REACH”, 23-24 September (find it here). ECHA has taken part of several QSAR and REACH targeted seminars to give feedback how the method has been used (find links to these seminars here (1) and here (2)). Practical Guide 10: How to avoid unnecessary testing on animals. QSARs – Quantitative Structure-Activity Relationships are mathematical relationships between the chemical structure of a substance and its properties. QSARs can be used to predict a wide range of physical, biological, and environmental properties thereby reducing or even eliminating the need for costly laboratory tests. 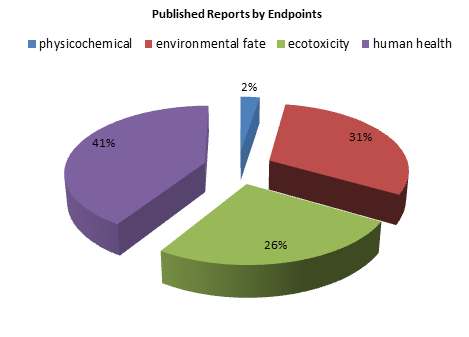 QSARs are available for various physical –chemical, ecotoxicity, toxicity endpoints. One of the most talked issues in ECHA’s guidances on QSAR is the applicability domain of the model. The results are derived from a (Q)SAR model whose scientific validity has been established. The substance falls within the applicability domain of the (Q)SAR model. The results are adequate for the purpose of classification and labelling and/or risk management. Adequate and reliable documentation of the applied method is provided. If any these conditions are not met, the (Q)SAR results cannot be used instead of testing but may be used as part of Weight of Evidence approach. Role of the Applicability Domain for Individual Models and Chemical Space Coverage. Defining model applicability domains is an active area of modern QSAR research. Every QSAR model or model system has an applicability domain where the particular model can be used. Based on the chemical range of the training set, each model is applicable to only these compounds that are reasonably similar to the training set compounds. Unfortunately, the applicability domain is commonly overlooked when making predictions. Every QSAR model can formally predict the relevant target property for any compound for which structural descriptors can be calculated. However, since each model is developed using compounds in the training set only (that cover only a small fraction of the entire chemistry (i.e., descriptor) space), the limits for the applicability domain for each model should always be defined. This restriction prevents making predictions for compounds that differ substantially from those in the modeling set. Generally, there is no universal method of defining the AD in the descriptor space, especially when using variable selection techniques. Global applicability domains are defined in the complete chemistry space that is, using all descriptors, whereas local domains are defined in the context of specific variable selection models using only selected (optimized) variables. Each participating group (with one exception) has adopted its own definition of the AD in the context of the respective QSAR methods. Another closely related parameter is chemistry space coverage. Thus, as a consequence of defining the AD, only a certain fraction of compounds in any external data set is expected to fall within such a domain. This fraction is therefore referred to as the data set coverage. The choice of descriptors plays a more important role than the choice of modeling techniques. For any individual model, using an AD is definitely critical, even if the better accuracy is often balanced with the low coverage of the external validation set. To help industry and government authorities identify suitable (Q)SAR models, the JRC have developed a web-based inventory of high-quality documentation on (Q)SAR models that are potentially useful for regulatory use. The JRC QSAR Model Database is designed to provide publicly-accessible information on (Q)SAR models and to enable the on-line submission of QMRFs by any developer or proponent of a (Q)SAR model. Molcode has published 40 QMRF reports and has additionally submitted more than 20 model reports in JRC QSAR Model Database. The speaker faculty for March 2012 includes the European Commission, ECHA, CEFIC, A.I.S.E, Member State Representatives including BAuA and HSE plus key industry players from major chemical manufacturers and downstream users. BRAND NEW: Insight into the 2012 review of REACH: Stay one step ahead and be amongst the first to gain insight into the review of REACH directly from the Deputy Head of Unit- Chemicals- REACH. 3.Comment on endpoint: Dermal irritation is the production of reversible inflammatory changes in irritation skin following the application of a substance. The skin irritation potential is described by the Primary Irritation Index (PII), calculated from erythema and oedema grades based on experimental rabbits. The maximum PII is 8 and the minimum is 0. The grading scale for irritant effects on rabbit skin were originally proposed by Draize and adopted by the OECD (Test Guideline 404) and the US and EU regulatory agencies. The PII can be calculated as: PII = [SUM(Erythema 24/48/72 h)+SUM(Oedema24/48/72 h)] (3 x no. animals) where Erythema is redness of skin produced by vascular congestion or increased perfusion, and Oedema is the presence of abnormally large amounts of fluid in the intercellular tissue spaces of the epidermis, dermis or subcutaneous tissues.